During the 1960s and early 1970s, a group of talented Los Angeles-based studio musicians became the uncredited force behind a ton of rock ‘n’ roll hits. Dubbed The Wrecking Crew, these musicians worked with groups (The Mamas and the Papas, The Beach Boys, and The Byrds), individual performers (Cher and Nancy Sinatra) and a host of others. Sometimes, the members of The Wrecking Crew played on recordings because they were better than a band’s real members, who were told to take a hike. 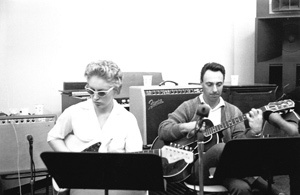 The documentary named for The Wrecking Crew revolves around major personalities in this respected group, notably bassist Carol Kaye and guitarist Tommy Tedesco. Directed by Tedesco’s son Denny, the movie pays tribute to musicians who, for the most part, remained anonymous to the public. The film acquires poignancy because many of those interviewed (Tedesco began the project in the mid-1990s) are no longer with us and because these gifted musicians became less important as bands became more musically proficient. It may come as a surprise to the uninitiated (that would include me) to learn that Glen Campbell began his career as a well-respected studio guitarist, only later establishing himself as a solo performer. The Wrecking Crew may not be in the same league as some of its predecessors (20 Feet From Stardom or Muscle Shoals, for example), but it’s a valuable addition to the expanding number of documentaries that have been chronicling the history of popular music.